A light and gentle conditioning treatment with the delicate sweet smell obtained from the ripe seeds of the Sweet Almond tree. In Ayurveda, Sweet Almonds are considered a nutrient for the brain and nervous system and also said to induce high intellectual level and longevity. Rich in Vitamins A and E, this Organic Sweet Almond Oil nourishes and improves complexion reviving its natural glow. Useful for lightening dark circles, spots and marks and can be used even by delicate, irritated and sensitive skin types. Smoothes hair cuticles, helps control hair fall and adds lustre to damaged hair. Ideal for baby massages. Explore the entire range of Dark Circles & Wrinkles available on Nykaa. 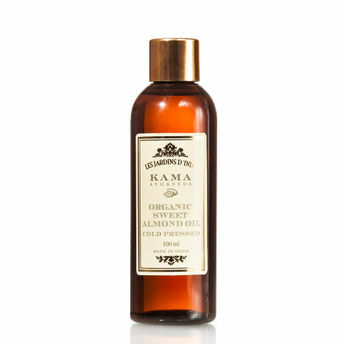 Shop more Kama Ayurveda products here.You can browse through the complete world of Kama Ayurveda Dark Circles & Wrinkles .Alternatively, you can also find many more products from the Kama Ayurveda Organic Sweet Almond Oil range.